As discussed earlier, hydronium and hydroxide ions are present both in pure water and in all aqueous solutions, and their concentrations are inversely proportional as determined by the ion product of water (Kw). The concentrations of these ions in a solution are often critical determinants of the solution’s properties and the chemical behaviors of its other solutes, and specific vocabulary has been developed to describe these concentrations in relative terms. A solution is neutral if it contains equal concentrations of hydronium and hydroxide ions; acidic if it contains a greater concentration of hydronium ions than hydroxide ions; and basic if it contains a lesser concentration of hydronium ions than hydroxide ions. And so, at this temperature, acidic solutions are those with hydronium ion molarities greater than 1.0 10−7M and hydroxide ion molarities less than 1.0 10−7M (corresponding to pH values less than 7.00 and pOH values greater than 7.00). Basic solutions are those with hydronium ion molarities less than 1.0 10−7M and hydroxide ion molarities greater than 1.0 10−7M (corresponding to pH values greater than 7.00 and pOH values less than 7.00). At this temperature, then, neutral solutions exhibit pH = pOH = 6.31, acidic solutions exhibit pH less than 6.31 and pOH greater than 6.31, whereas basic solutions exhibit pH greater than 6.31 and pOH less than 6.31. This distinction can be important when studying certain processes that occur at nonstandard temperatures, such as enzyme reactions in warm-blooded organisms. Unless otherwise noted, references to pH values are presumed to be those at standard temperature (25 °C) ([link]). [link] shows the relationships between [H3O+], [OH−], pH, and pOH, and gives values for these properties at standard temperatures for some common substances. The pH and pOH scales represent concentrations of [H3O+] and OH−, respectively. The pH and pOH values of some common substances at standard temperature (25 °C) are shown in this chart. What is the pH of stomach acid, a solution of HCl with a hydronium ion concentration of 1.2 10−3M? Air-saturated water has a hydronium ion concentration caused by the dissolved CO2 of 2.0 10−6M, about 20-times larger than that of pure water. Calculate the pH of the solution at 25 °C. Calculate the hydronium ion concentration of blood, the pH of which is 7.3 (slightly alkaline). Calculate the hydronium ion concentration of a solution with a pH of −1.07. Carbon dioxide is naturally present in the atmosphere because we and most other organisms produce it as a waste product of metabolism. Carbon dioxide is also formed when fires release carbon stored in vegetation or when we burn wood or fossil fuels. Sulfur trioxide in the atmosphere is naturally produced by volcanic activity, but it also stems from burning fossil fuels, which have traces of sulfur, and from the process of “roasting” ores of metal sulfides in metal-refining processes. Oxides of nitrogen are formed in internal combustion engines where the high temperatures make it possible for the nitrogen and oxygen in air to chemically combine. Acid rain is a particular problem in industrial areas where the products of combustion and smelting are released into the air without being stripped of sulfur and nitrogen oxides. In North America and Europe until the 1980s, it was responsible for the destruction of forests and freshwater lakes, when the acidity of the rain actually killed trees, damaged soil, and made lakes uninhabitable for all but the most acid-tolerant species. Acid rain also corrodes statuary and building facades that are made of marble and limestone ([link]). Regulations limiting the amount of sulfur and nitrogen oxides that can be released into the atmosphere by industry and automobiles have reduced the severity of acid damage to both natural and manmade environments in North America and Europe. It is now a growing problem in industrial areas of China and India. For further information on acid rain, visit this website hosted by the US Environmental Protection Agency. What are the pOH and the pH of a 0.0125-M solution of potassium hydroxide, KOH? The hydronium ion concentration of vinegar is approximately 4 10−3M. What are the corresponding values of pOH and pH? The acidity of a solution is typically assessed experimentally by measurement of its pH. 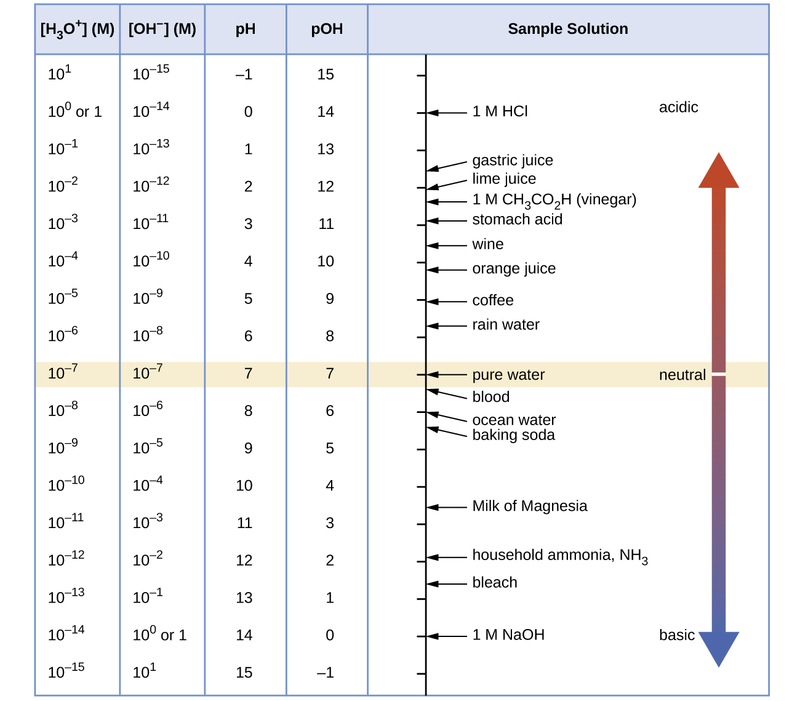 The pOH of a solution is not usually measured, as it is easily calculated from an experimentally determined pH value. The pH of a solution can be directly measured using a pH meter ([link]). 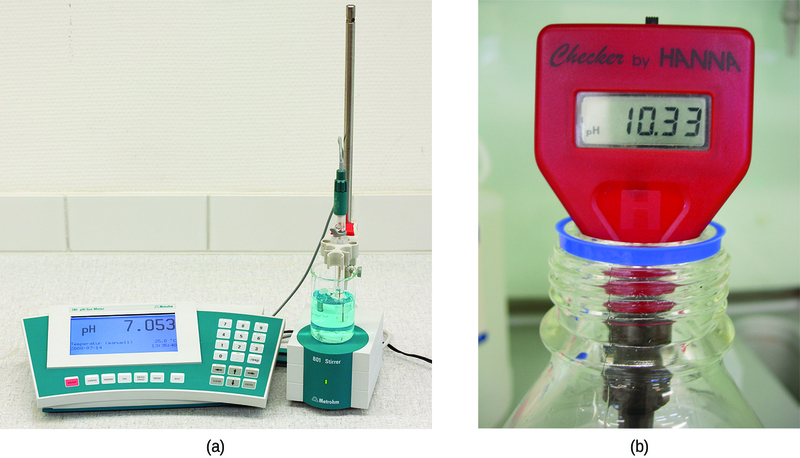 The pH of a solution may also be visually estimated using colored indicators ([link]). Explain why a sample of pure water at 40 °C is neutral even though [H3O+] = 1.7 10−7M. Kw is 2.9 10−14 at 40 °C. [H3O+] = [OH−] = (2.910−14)1/2 = 1.7 10−7. The ionization constant for water (Kw) is 2.9 10−14 at 40 °C. Calculate [H3O+], [OH−], pH, and pOH for pure water at 40 °C. The ionization constant for water (Kw) is 9.311 10−14 at 60 °C. Calculate [H3O+], [OH−], pH, and pOH for pure water at 60 °C. What are the pH and pOH of a solution of 2.0 M HCl, which ionizes completely? What are the hydronium and hydroxide ion concentrations in a solution whose pH is 6.52? Calculate the hydrogen ion concentration and the hydroxide ion concentration in wine from its pH. See [link] for useful information. Calculate the hydronium ion concentration and the hydroxide ion concentration in lime juice from its pH. See [link] for useful information. The hydronium ion concentration in a sample of rainwater is found to be 1.7 10−6M at 25 °C. What is the concentration of hydroxide ions in the rainwater? The hydroxide ion concentration in household ammonia is 3.2 10−3M at 25 °C. What is the concentration of hydronium ions in the solution? pH and pOH by OpenStaxCollege is licensed under a Creative Commons Attribution 4.0 International License, except where otherwise noted.